Configuration: 2 boxes per case. 1 pack per box. 5 cards per pack. 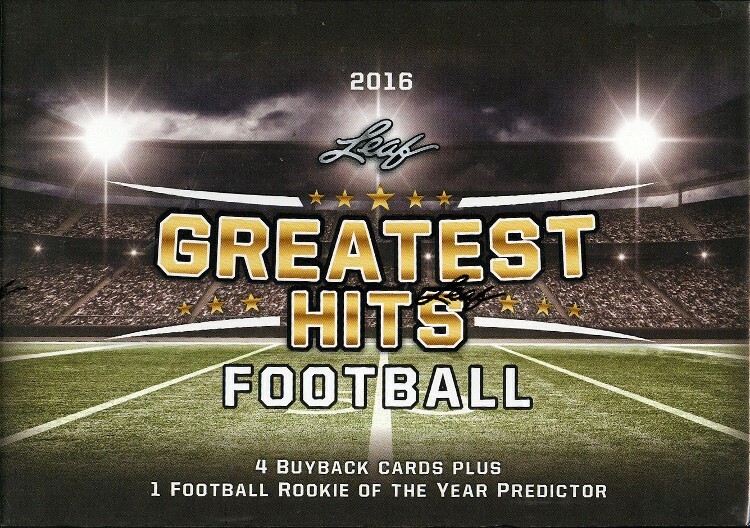 Leaf Is Pleased To Announce The Newest Expansion To Its Popular Greatest Hits Brand Of Repackaged Products, 2016 Leaf Greatest Hits Football. After Phenomenal Success In The Baseball And Basketball Categories, This Football Release Is Sure To Be One Of The Year's Most Exciting! This Buyback Product Celebrates Everything That Is Great About Football Cards, Including: The Hottest Rookie Cards, Graded Vintage Cards, Crazy Signed Cards And Incredible Memorabilia Cards.